For any event presenter, fans are king. So as a presenter, it’s important to consider what your fans expect from your ticketing system. According to IBISWorld Report, ticket purchasers highly value a ticketing system’s “user-friendliness”. Their Ticketing Software Satisfaction Survey report asked ticket purchasers to rate a list of functions in terms of their perceived importance in a ticketing solution. Approximately 40% of respondents ranked easy navigation as the most important criteria. 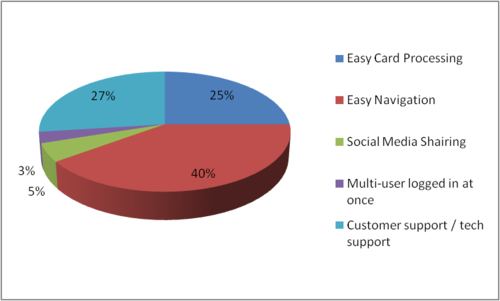 25% of respondents selected easy card processing, and another 27% selected Tech Support. Clearly the vast majority of ticket purchasers are primarily looking for a hassle-free experience. Yapsody truly values what fans mean to event presenters, and that’s why we are dedicated to offering simple ticketing with excellent support and all at a price that no fan or presenter could ever refuse. Hope you found this survey report interesting and helpful. Please feel free to share your comments and thought with us.